The review of the product Thyroid Care which has been manufactured by Kroeger Herb is stated as follows. The manufacturer of this product claims that it is an all-star combination of various nourishing herbs and it is very effective when it comes to maintaining a healthy thyroid. The manufacturer claims that it can also improve the metabolism of your body. Continue reading, if you want to know more about its ingredients as well as our opinion of whether it is the right product to take for thyroid issues. It is recommended that, adults take two capsules of this product daily twice preferably with food and water. There are no serious side effects of this product as it is made up of natural ingredients. However, pregnant and lactating women should only use this product after consulting with their doctor. In case of an allergic reaction to any of the ingredient in the product, you should contact a doctor immediately. The price of this product is not listed on the company’s website which can be very inconvenient and frustrating. It is available on Amazon at a price of $10.47 and includes 100 capsules. The manufacturer has not offered any kind of exchange, return or money back guarantee for this product and this is an area of concern because if you are not satisfied with the product and if it doesn’t show the desired results then you have no way of getting your money back. The product also doesn’t have any reviews on the company’s website which makes it a questionable purchase. Thyroid Care which was formerly known as Metabolizer is an all-star combination of vital and nourishing herbs and is manufactured by Kroeger Herb. It can boost your metabolism and help you maintain a balanced thyroid. It works best, if you modify your lifestyle and eliminate caffeine, sugar, stress and poor nutrition. It is made up of natural ingredients but it contains gelatin and as a result is not suitable for vegans and vegetarians. The manufacturer of this product also doesn’t offer any kind of return, exchange or money back guarantee and the fact that there are zero reviews of this product on the company’s website makes it a questionable purchase. So, to conclude, it is safe to say that this is not the best product for you. 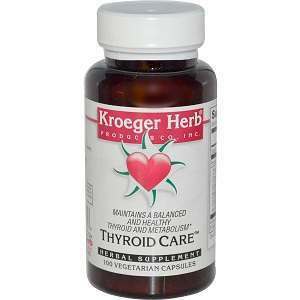 Lauren Shepherdson	reviewed Kroeger Herb Thyroid Care	on August 10th	 and gave it a rating of 2.